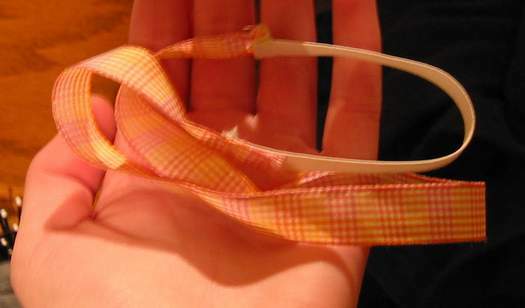 I made this hairband by buying a thin ribbon and some elastic which was a little less than 1 cm wide. Then I measured the distance from ear to ear and cut the ribbon about two iches longer than that. I handsewed the elastic to the ribbon by folding the edges of the ribbon under to make it look a little neater. Basically it was quite simple to make. 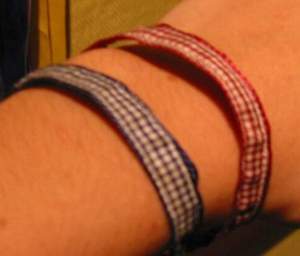 These ribbon bracelets are made from two 1 cm. wide ribbons that I sewed together. I wanted them to be a little thicker so I rolled up some tape and put that in the middle. After sewing over the tape I realized it kind of messed up my needle and made it all sticky which created lots of problems. 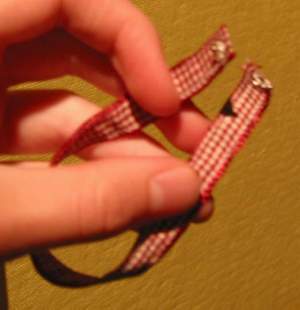 I then sewed on two little button things to the ends so they could snap close.